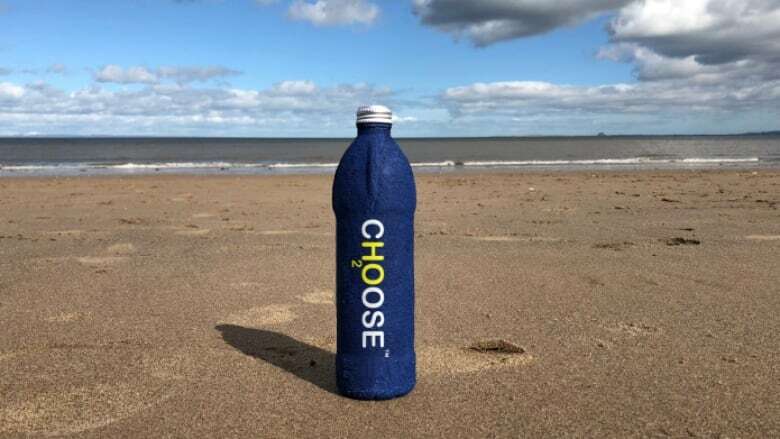 Choose Water, based in London and Edinburgh, is asking the public for funds to help get the bottles on the market. The company says it needs the money to fund new machinery, tooling, and distribution networks "so we can [compete] with the plastic big guns and get our bottles onto shelves as soon as possible." And as of Tuesday, the company's Indiegogo campaign had already raised more than £31,000, zooming past its goal of £25,000 ($43,500). James Longcroft started Choose Water two years ago. It bills itself as an ethical bottled water company that donates 100 per cent of its profits to charity. The charity, Water for Africa, drills and helps maintain and protect drinking water sources for communities in Africa. "We realized quite quickly that we were not only contributing, but were the problem," Longcroft told CBC's On the Money in an interview last week. 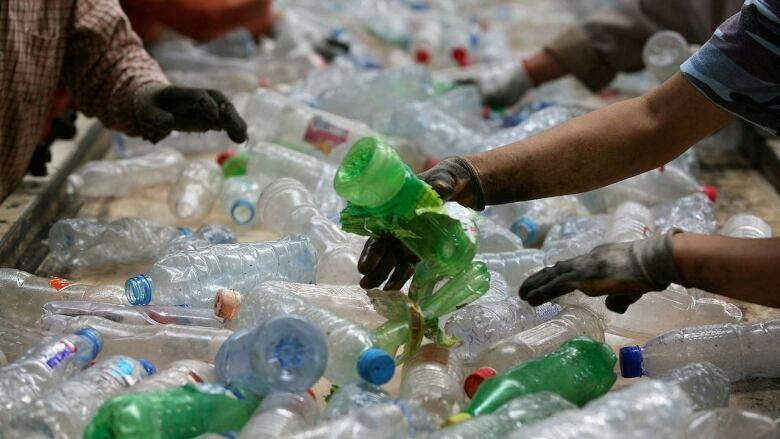 In 2016 alone, more than 480 billion plastic drinking bottles were sold around the world, according to a report by market research firm Euromonitor International, cited by the Guardian. Less than half were recycled. Longcroft decided his company would go plastic-free, although it continued selling water in glass bottles. As a result, he said, the company lost a large portion of its revenue stream. "So we had to develop something new." Longcroft, whose background is in chemistry, developed an outer casing made from recycled paper donated by local businesses. He then invented a waterproof inner liner by looking to nature for inspiration, he said. The company won't say what that is, as it hasn't yet "buttoned down" its patents. When asked by CBC News whether the material was already used in food, Longcroft responded by email, "I don't want to give too much away, but the products in the liner are all natural and plant-based." The company's crowdfunding site on Indiegogo says the liner materials are fully biodegradable, sustainably sourced, and have been "proved to be beneficial to the environment, neutralizing soil acidity and providing nutrients to aquatic environments." Longcroft claims the bottle has a shelf life of 18 months or slightly less. 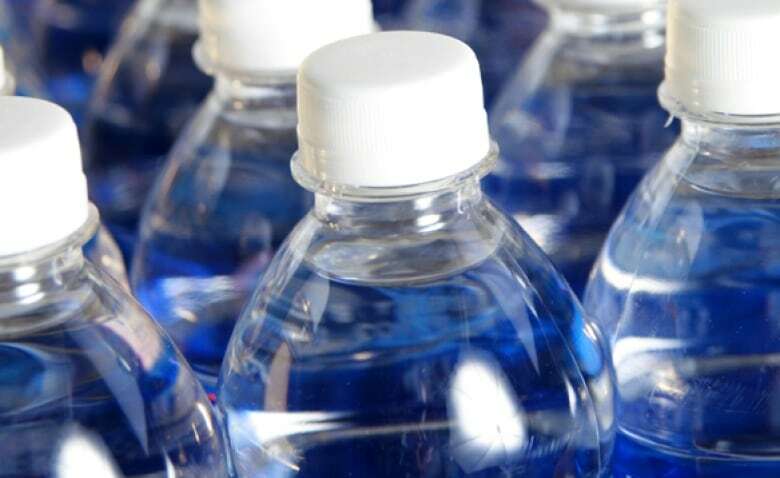 Bottled water in plastic or glass bottles is considered by the U.S. Food and Drug Administration to have an unlimited shelf life and it isn't required to have an expiration date, although many are stamped with a date within one or two years of bottling. The plastic-free bottle is designed to break down once the outer casing becomes saturated with water, Longcroft said. That's why it's stable sitting on a store shelf, but quickly decomposes if left outside. However, he said, like a paper coffee cup or cardboard box, it can withstand pretty high levels of water exposure, so it won't disintegrate in your hand if it starts to rain. It's also designed to be more shatterproof than glass and can "withstand most normal day drops and knocks." When asked if it requires further approval or testing by agencies that regulate food and drink safety, Longcroft said it is undergoing regulatory testing at the moment. It's also being tested as a container for juice, milk, pop and household products. "The first tests are looking very promising," he said. Charles Fishman, a U.S.-based water journalist and author of The Big Thirst: The Secret Life and Turbulent Future of Water, said it's a clever idea and has the attributes you'd want a container to have. But he's not convinced anyone will buy it. "One of the reasons that bottled water is so popular is it's sold in this clear, beautiful bottle," he said. "Just seeing it, you feel, 'Wow, I'm thirsty and that's what I want'.… The container is part of the marketing." He noted that most bottled water is sold by huge corporations like Nestlé, Coke and Pepsi. "They're not going to put their water in a blue, opaque container and then destroy their water sales." When asked whether it would consider a bottle like this, Nestlé said in an email to CBC News that it believes the industry's first priority should be to increase collection and recycling of PET plastic bottles. It says it is using recycled plastic in some bottles and trying to develop a way to make PET plastic bottles from bio-based materials. "We are also interested in all new technologies that could present alternative scenario for the end of life of water bottles," the company wrote. It also said it would be happy to get more technical information about Choose Water's bottle. But if Choose Water sells just its own water in its container, the impact would be just "a drop in the ocean." Of course, the repercussions of bottled water aren't felt through its disposal alone. Ashley Wallis, water program manager at Environmental Defence, a Toronto-based non-profit environmental advocacy group, noted that materials are needed to manufacture and ship the bottles as well. She said she doesn't know enough about the materials in Choose Water's bottle to be able to comment on the impact of its entire life cycle, but it would reduce litter and visible waste. "I do think there's probably a role that technology has to play in getting us off our plastic habit," said Wallis, whose group is campaigning for a deposit on plastic bottles in Ontario in order to reduce plastic litter. This isn't the first time someone has tried to develop a paper water bottle. A U.S. company, Paper Water Bottle, ran a successful Kickstarter campaign last year and raised $10,000 US for its own version, which has a thin, recycled plastic liner. An update in February said the company was fulfilling production that month. As of Tuesday, the company had not responded to a request to talk to CBC News.